There are different types of overseas qualifications assessments – and different organisations that manage each type of assessment - depending on why you need an assessment. It is important that you select the right assessment type – listed below – to suit your purposes. Further study in Victoria/Australia – apply directly to the university or education provider for an assessment. See universities in Victoria. 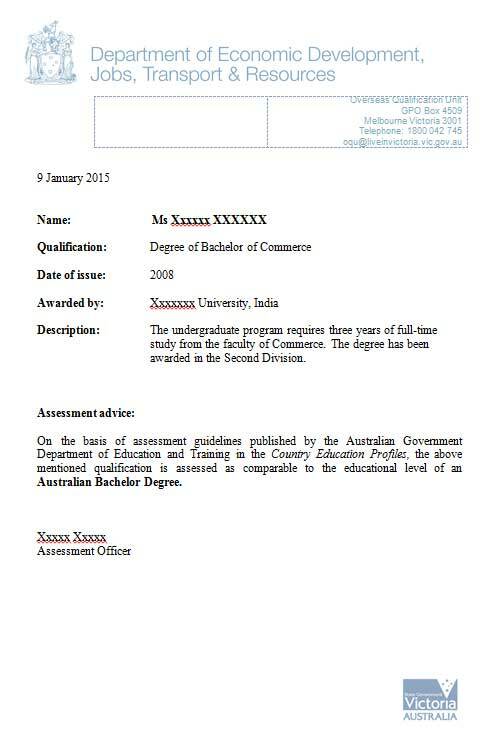 Below is an example of our OQU Assessment Advice – it is an official document that confirms the recognition of an overseas qualification and its comparable level in Australia, based on the Australian Government’s Department of Education and Training assessment guidelines.